Make your Super Bowl Sunday epic with Visa!!! And here's one I'm in with several others, including 3-time Super Bowl champion and current ESPN NFL Analyst Mark Schlereth! There are several other videos, so be sure to check them out on YouTube. My sincere thanks to Visa and everyone who took part in this. It was such a treat, and I am excited to see the finished products. Don't forget to let Visa know how you plan to make this Super Bowl Sunday an epic day...I hope you win something! And have a great time this Sunday. Make it epic!!! Which Texas BBQ joint will be the star of 2013? 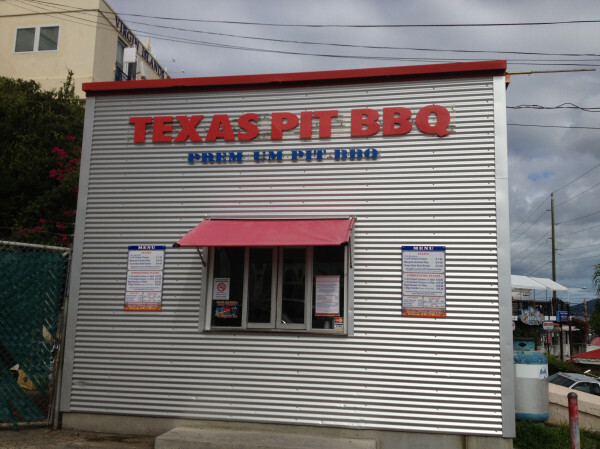 Which Texas BBQ joint will be the star of 2013? Name just one! And feel free to give the reasons for your choice. Stinkin' Good Green Chile party!!! Earlier this month, I had some friends over to the house to try the 4 green-chile sauces that Mark Schlereth sent me. We had carnitas, baked chicken, basmatic rice, black beans, sweet onions, red & green bell peppers, white & blue corn tortilla chips, cheese, lettuce, the 4 sauces: pork (medium), pork (hot), chicken (medium), & vegetarian (medium). As you can see, both old & very young enjoyed it! I've made many stops for baked goods in West, TX, but until last week I'd never ventured any farther than the Czech bakery right on the access road (I-35, Exit 353). This past Tuesday, I exited in West and wanted to see the town a bit. Well, lo and behold, just as soon as you head off the access road and into town, there's a BBQ joint on the left. I'd never heard of it, so I posted a picture of it on Twitter to see if anyone could identify it. No one did. Shooters BBQ in West, Texas. Anyone been? Last night, I found Unique Eats: BBQ on Hulu. Unique Eats is a show on the Cooking Channel, and this episode (Season 3, Episode 6) aired on June 12, 2011. So, obviously, I'm late finding this, but so bet it. I'm guessing many of you haven't seen it either. The episode highlights a few BBQ joints from around the country, and the first one highlighted is Austin's very own Franklin Barbecue. Texas Photo Roundup ticket giveaways! (1) Leave a comment below this post. Everyone who does this will get his/her name in a hat, and I will draw a winner. The deadline to enter your name is Tuesday, February 5! Very shortly thereafter, their dinners arrived, and it was all camera phones and all smiles. Before they loaded back into the van to head back to the hotel, our group got together for a farewell pic. Make no mistake: These East-and-West Coasters can eat! They mowed down 7 BBQ meals (not counting the BBQ they had on their own and the non-BBQ food they had during the trip) in 2 days and were still standing and smiling when it was all said and done. If I may take the liberty to speak on behalf of, well, Texas: Job well done!!! After starting Day 2 of our late-December BBQ tour at Cooper's in Llano, we drove our Texas Q Tours crew back down Hwy 71 to Spicewood and pulled into the parking lot of Opie's Barbecue, for their 2nd meal of the day. Once inside, the crew took a look at the array of proteins and started placing their orders. Then, they settled into with huge spreads and went to work. After they stuffed themselves, they got a private tour of the pit from pitmaster Marco Oglesby, who'd just returned to work after being sick for a time (Welcome back, Marco. We're glad you're better!). ...and then did some clowing around outside in front of the old roadside smoker! 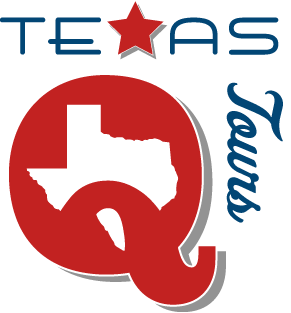 After a 9-hour Day 1, our Texas Q Tours group slept hard and then got up early for Day 2. A day that would run 13.5 hours, from start to finish. With caffeine in hands, we started the trip with a calm, beautiful drive out Highway 71 to Llano. Pulled into the parking lot of Cooper's Old Time Pit Bar-B-Que for their first meal of the day. The folks at Cooper's set us up with a nice spread in the overflow room, and our group settled in for "breakfast." After the meal, our group was given a private tour of the mesquite-coal-fired pits, where they learned about the process of pit cooking, Cowboy style, something you don't see in these parts as much as you see traditional smoking or rotisserie-style cooking. Getting There: Madroño Ranch in Medina, Texas, is an easy drive from either San Antonio (about 1½ hours) or Austin (about 2½ hours). Major airlines serve airports in both cities. Getting Ready: Guests are required to have a Texas hunting license; a nonresident five-day license will set you back $48 and can be ordered online through the Texas Parks and Wildlife Department (tpwd.state.tx.us). If you're starting off in Austin, consider a trip down to the Lone Star Gun Range near Lockhart, about an hour south of town. 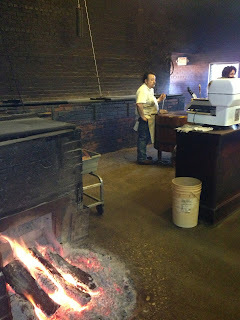 After your practice, head into Lockhart for barbecue at Black's (215 North Main St., blacksbbq.com ). What to Bring: Layered hunting garb—camouflage and earth tones are recommended, along with sturdy boots. A camera and notebook are useful for the butchering and cooking classes. Getting In: Dai Due runs a handful of weekend-long events each year. The next hunting event, Jan. 18-20, is already full. Check the listings on the Dai Due website ( daidueaustin.net ) and sign up for their mailing list to learn about upcoming slots. Weekends cost $1,875." The 4th & final stop of Day 1 of December's Texas Q Tours BBQ trip was Smitty's Market in Lockhart, TX. We left the van at Black's and burned some calories by walking to Smitty's, needing all the help we could get to man up and eat a 4th BBQ meal. ...our group settled in at a table in the back and enjoyed some sides before the meats arrived. And then the meats arrived! Once our crew polished off that pan, I drove a very tired, very full van back to Austin, for a good night's rest. With the day coming up, we all were gonna need it. Not our traditional notion of BBQ and definitely not Texas BBQ, but here are some pics from a meal I had earlier this month at Sam Woo BBQ (taxi driver's recommendation) in Chinatown, Las Vegas. Not a smoker in sight, but it's duck, pork, and beef, so I think it's worth a post. February 23 BBQ trip: Lockhart or bust! It's high past time that we have another first-come, first-served BBQ trip, so today I announce our next one: Saturday, February 23. Lockhart, Texas. Meals at Black's Barbecue, Smitty's Market, & Kreuz Market. 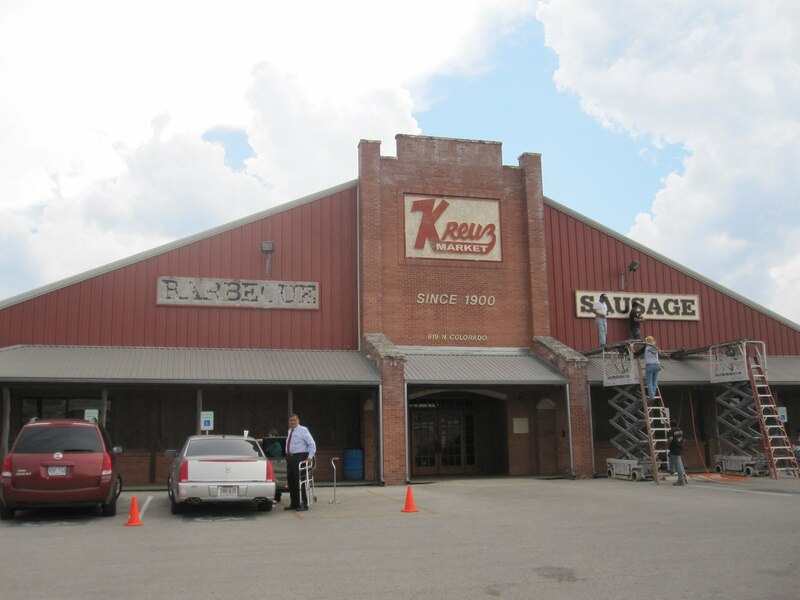 (Time allowing, we might make 1 or 2 non-BBQ stops of interest in Lockhart.) Upon our return to Austin, we will have the pleasure of a private tour & tasting at Hops & Grain Brewing. And, of course, your ticket will get you some swag. Depart Austin at noon. Tour concludes at 4:30. Mark Schlereth dinner party tonight!!! Loadin' up & setting off for a 2-day tour! 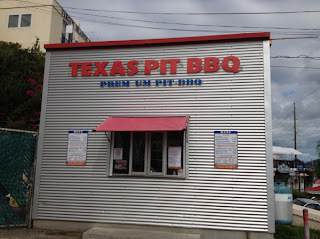 Which Texas BBQ joint tops your 2013 hit list?